Equilibar is proud to offer a wide range of precision electronic pressure regulators (EPR). Full scale ranges available from 0.3 psig (20 millibar(g)) to 3000 psig (68 bar(g)). Our EPR offerings are available in standard analog style or high performance digital display style. These pressure controllers are useful for a variety of applications, and are also frequently used to provide the pilot setpoint for our dome loaded back pressure regulators. Many pressure ranges are available with ultra high resolution performance. Our engineers will work with you to find the right solution to your automation challenge. Our products are 100% designed and manufactured in the USA, and are supported by one-year warranty. Contact our engineers for assistance in selecting the optimum product for your unique requirements. Learn how electronic pressure regulators work. 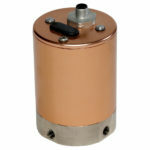 The EPR Series is a high resolution electronic pressure regulator series. The EPR provides a regulated output pressure that is proportional to an electrical command signal input. The EPR units are available in a wide range of calibrated ranges covering vacuum through 3000 psig (200 Bar). The EPR is available with 4-20 mA or 0-5 VDC analog input signal types, and RS-232 or RS-485 (optionally) serial digital inputs. Read More about using an electronic pressure regulator to pilot a dome loaded pressure regulator for automated process control. The schematic at right shows how an Equilibar Back Pressure Regulator can work together with an electro-pneumatic regulator to provide automated pressure control with virtually any type of pump.